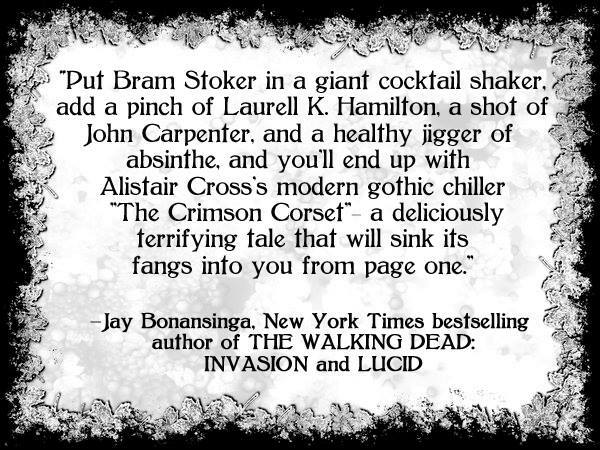 Following yesterday’s interview at Tamara Thorne’s Little Blog of Horrors, here is an excerpt from my upcoming novel, The Crimson Corset, which will be available in just a few weeks. Untidy, Ryan Closter had called it. The young deputy had a knack for understatement and when Ethan arrived at the scene, he was prepared to be put off – but this was downright ghastly. This wasn’t the way Ethan liked to start his mornings. At the center of the bed lay the woman, face-down, in her own dried pool of fluids. “Our paths crossed recently.” Ethan wouldn’t have been surprised to hear the woman had overdosed on something, but would never have guessed she’d go like this. The deputy swallowed and nodded, his face clammy. The last thing they needed was for someone to throw up on the crime scene – not that it’d be the first time it had happened. The room was hot, intensifying the reek of blood, of innards – of death. Dozens of flies crawled lazily over the body and more were landing. Ethan’s own stomach roiled a little. He hadn’t been sick at a scene since his earliest days on the force and he didn’t intend to buckle now, but it wasn’t easy. He’d never seen anything this theatrical; it looked like the police photographs from the Jack the Ripper crimes. But in horrible living color. He moved closer and stared down at the woman on the bed. Two stumps of spine, glistening white, jutted out of the mess that was the rest of her. It was as if someone had unzipped her skin, reached inside, and yanked her backbone out. And they’d managed to snap it in half in the process. The woman was tangled in white sheets reminding him, morbidly, of an old barber’s pole. Red and white, red and white, blood and bandages, blood and bandages. He walked around the bed, seeing it from all angles. Every crime scene told a story, you just had to know how to read it. And this one, Ethan was certain, was one hell of a tale. The more he saw, the more certain he became of two things. One, Rose’s killer was not human, and two, it was not an animal. Not in the usual sense, anyway. He bent and moved the victim’s hair back, careful not to disturb anything. He saw the bite marks on her neck that confirmed his suspicions. He’d have them checked against dental records and if he was lucky – which was highly unlikely – maybe they’d catch the perp fast. There were also several places along her shoulders and arms where the skin was torn. Someone went to town on her. The thick sickening feeling in the pit of his stomach went colder. Ethan’s knees popped as he stood and moved to the window. He pinched back the blood-spattered white curtains and stared down. Outside, the Ivory Heights apartment complex was already surrounded by a swarm of onlookers, and it was only going to get worse. Rose Keller’s one-bedroom, second-story apartment would soon be a frenzy of technicians, detectives, plainclothes, more uniforms, a photographer, and probably even a man with a video camera. There was no dignity in death, he thought as he looked at the shredded body on the bed. Especially not when you die like that.